A new concept of the property in Marbella, a hidden modern oasis ! This unique design villa blends in with its surroundings. 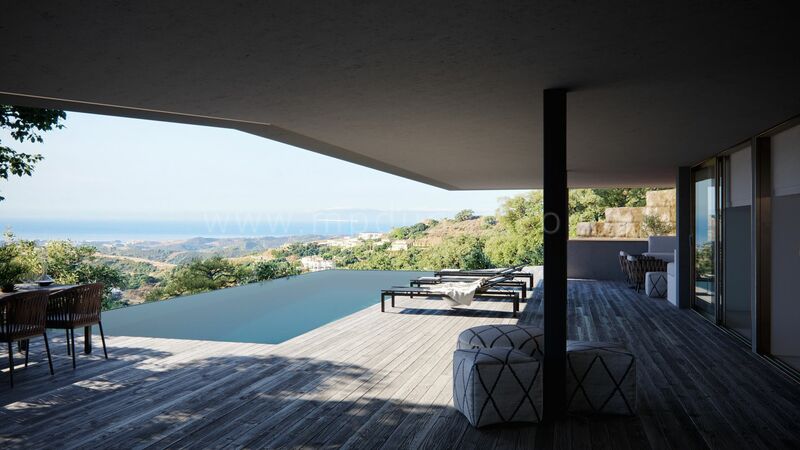 Expected to be completed in the summer of 2019, this first villa is set on a strategic point of the Monte Mayor Country Club estate and offers spectacular views to the Mediterranean, the Monte Mayor castle and picturesque valley. You will find here an amazing green roof, covered with the same plants found in the Monte Mayor valley. There is an entrance with carport and access to the villa. Elevator to all floors. On the main floor there are spacious living room with double chimney, natural light, open plan fully fitted kitchen and dining, master bedroom en suite. You will have direct access to spacious covered terraces with panoramic views. On the lower level there are three guest bedrooms en suite, lounge terrace with exterior kitchen and bar. Infinity pool which is finished dark green tiles to blend with the nature. A beautiful mix and blend with the natural surroundings, low maintenance ‘a penthouse’ style villa.